If credit expansion leads the stock market, the market is in trouble. 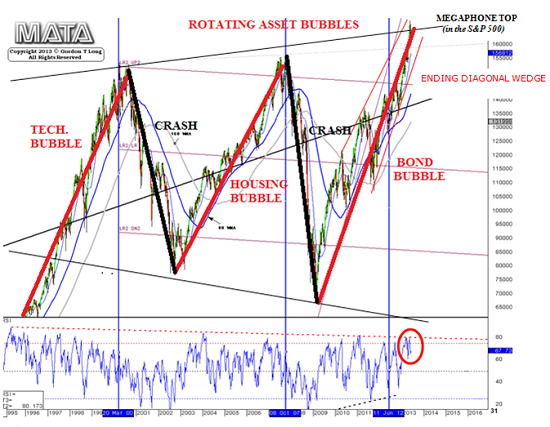 Before you buy the dip "because this Bull market will run until 2016," please ponder this chart from our Chartist Friend From Pittsburgh of total credit and the Dow Jones Industrial Average (DJIA). Unsurprisingly, the stock market advances when credit is expanding and declines when credit growth slows. Why is this unsurprising? 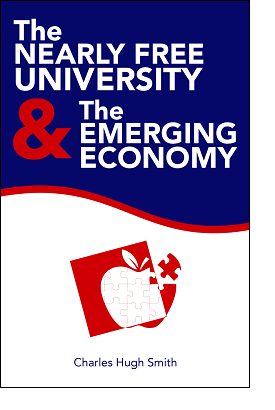 Because ours is a debt-dependent consumer economy: everything from local government building projects to the purchase of vehicles to going to college requires borrowing money (i.e. credit expansion). 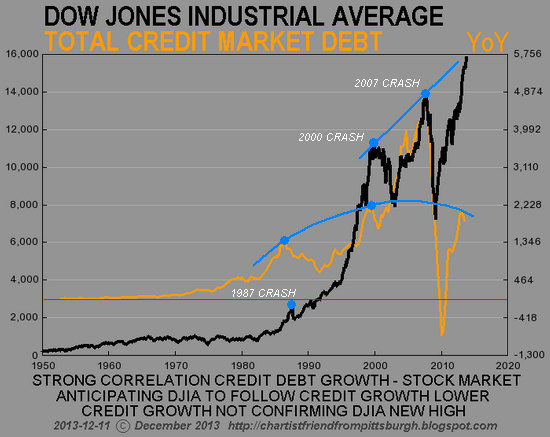 Total Credit Market Debt (TCMD) growth is not confirming the new DJIA high at all.The trend of TCMD growth clearly reversed lower in 2007 by making a new all time low. The uptrend of the DJIA appears to be up since it's recently made new all-time highs. The point is - there's a serious disconnect/divergence/non-confirmation going on here and in the end credit growth is the more important of the two and determines the trend because people can't make a move nowadays without taking out a loan (house, car, student, government spending, etc.). 1. Notice that credit growth is rolling over, and that its recent peak was significantly lower than the 2007 peak. In other words, despite rescuing the Too Big To Fail Banks (TBTF) to the tune of $16 trillion and the creation of $3.2 trillion that it pumped into the financial system to goose housing and stocks, the Federal Reserve's unprecedented campaign to reflate leverage and credit only managed a weak bounce from 2007 highs in credit growth. See those two little blips up in the real wages of the bottom 90%, circa 1999 and 2007? Those modest boosts in income were the result of monumental credit/asset bubbles. 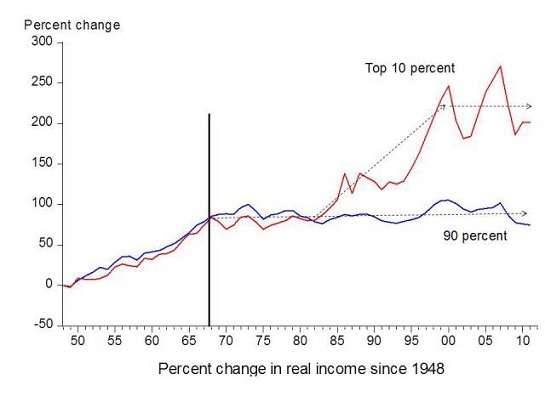 Once those bubbles popped, real income for 100% of households plummeted, and the bottom 90% saw its real income (i.e. the purchasing power of earnings) decline by 7%. You can't leverage more debt off declining income unless you loan money at near-zero rates of interest. That explains the Fed's Zero Interest Rate Policy (ZIRP), which has the sole purpose of enabling more leverage and debt even as real income stagnates. Buy the dip "because this Bull market will run until 2016?" Based on what? Does liquidity from the Fed ultimately drive the market, or does credit expansion drive the market? We will find out in 2014. Thank you, Colin C. ($5/month), for your lavishly generous subscription to this site-- I am greatly honored by your support and readership.